The 100-page comic is back! Granted, this won’t be news to many of you, especially since it’s been true for about six weeks by the time this edition of the Silver Age Sage hits the World Wide Web. Still, I was intrigued and went on down to Wal-Mart (yeah, can you imagine being able to pick up a comic at a store again? If only they’d had a spinner rack…) and picked up each of the 4 new offerings, which were Batman, Superman, Justice League of America and the Teen Titans. To my pleasant surprise, they were actually pretty good reading and, much like their predecessor in the 70s, contained one new story along with some reprints although it seems to me the Titans issue may have had two new stories. At any rate, it was a nice new/old trip down memory lane. 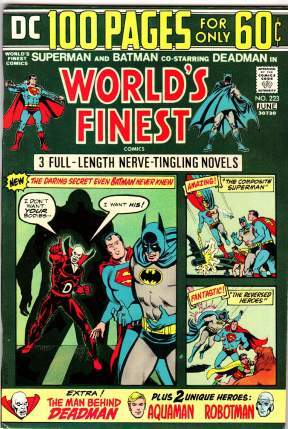 When I first became aware of these 100-page wonders as a kid, they were amazing to me. Not only were they huge, but you could get stories in there that you couldn’t get any other way through the carefully selected reprint selections. I have maybe a dozen in my collection and they always bring a smile to my face, even though that square binding was notoriously frail, so I handle them with kid gloves. 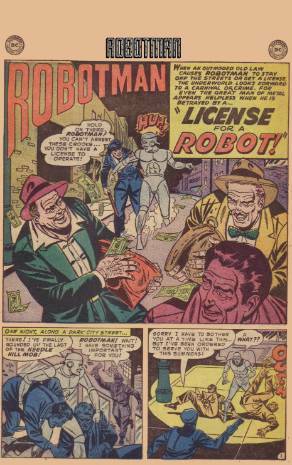 This short little 6-pager kicks off with Robotman busily apprehending members of the Needle Hill Mob. Just then a police officer comes running up and hands Robotman a summons. It seems that because he is a “mechanical conveyance,” under the city laws, he must be licensed! Appearing in court, it is explained to the metal marvel that the old law had been unearthed by an attorney, Edward Brent, as part of his efforts to clean up traffic and that all mechanical objects must be licensed. Robotman agrees to uphold the law, as is his habit, and reports to a city-owned scale for a weigh-in to determine his licensing fee. Luckily, he has a special hip compartment containing the necessary $20. Later, in a hideout, the same Edward Brent is keeping company with some shifty characters and is chortling about how Robotman will now have to wear license plates. One of the men in attendance ask how that will be helpful and Brent proceeds to explain that he’d specifically dug up the old law so that Robotman would have to wear special plates, but we’ll have to wait for the remainder of the explanation as it’s a shift in scenery to the big house where Brent passes along a set of plates to an inmate, instructing him to replace the ones for Robotman with these special ones. The next night it happens all over again at Riffany’s Jewelers, just around the corner from Robotman’s secret laboratory, but despite the close proximity, the thieves have again taken a powder. Baffled, he returns to his laboratory and happens to walk past a Geiger counter that begins to react. It then dawns on the crime-fighter that his newly installed plates on the front and back of his torso have been painted with Uranium paint (Ah, those carefree 1950’s) and if the crooks have a Geiger counter, they can tell when he is approaching. A little later the newly dubbed Geiger Counter Gang is robbing a bank when Robotman arrives unannounced by their Geiger counter. Robotman tells them between punches that he washed the Uranium paint off. The gang members flee, but thanks to a little planning ahead, the metal marvel tracks them via some radium paint he’d placed outside the bank door. However, when he reaches the gang’s hideout, the only one there is a dog. Meanwhile, over at the home of Edward Brent, he and the gang are about to split up the loot when Robotman arrives. Flabbergasted, Brent asks how Robotman made the connection and he states simply that he noticed the dog had a license and so he traced it to the owner, turning the tables on the license gig and putting the gang away. Incidentally, the law was to be changed within a few days, so this was the first and last time we would see Robotman sporting license plates. Not a bad little tale at all and I always appreciate the ability of a writer and artist to wrap one up in so few pages. 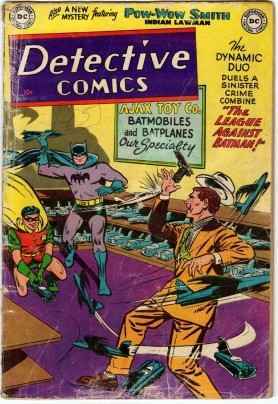 I did do a little more research on this Golden Age character and it turns out he was the creation of Jerry Siegel and Leo Nowak and first appeared in Star Spangled Comics #7 in April of 1942 and his original name was Robert Crane. He assumed the Paul Dennis identity to provide a death to convict his murderer. 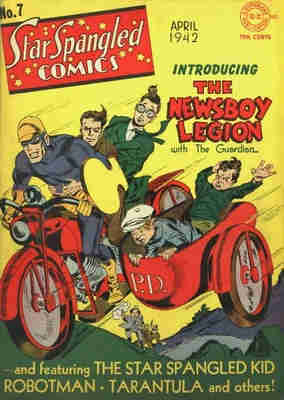 He was also a member of the All-Star Squadron. It’s obvious to me that Cliff Steele was inspired by Paul Dennis, although it was strictly Cliff’s brain placed into his robot body. So, here’s to the original Robotman, who was more than meets the eye and his adventures are still entertaining. Do remember to join us again on the 1st of September for another review. Comments and feedback are always encouraged, so express yourself to: professor_the@hotmail.com.